Police say no-one was detained. 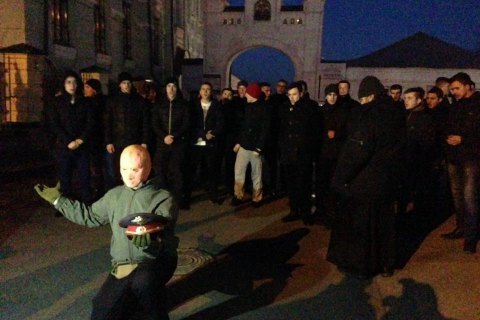 Activists of the far-right movement C14 have held a protest outside the Kyiv Pechersk Monastery (Lavra). Police said no-one was detained during the event. Several dozen activists first blocked the entrance to the monastery. "Separatists and FSBists [employees of the Russian Federal Security Service] have their headquarters in Lavra. They refuse to hold funeral services for ATO [antiterrorist operation] fighters and those who were baptized in churches other than those controlled by the Moscow Patriarchate," C14 said on Facebook. В сообщении говорится, что в Лавре находится штаб сепаратистов и фсб-шников. There were verbal exchanges and minor scuffles during the event. Bishop Pavlo, the prior of the Kyiv Pechersk Monastery, came out to meet the protesters. He was joined by around 30 members of the clergy who started singing "God's son is born". The Ukrainian Orthodox Church of the Moscow Patriarchate came under public pressure after its priests in Zaporizhzhya refused to hold a funeral service for the tragically killed child because he was baptized in a church controlled by the Ukrainian Orthodox Church of the Kyiv Partiarchate which Moscow does not recognize. A campaign to bring toys to Moscow-controlled churches all over Ukraine was born online.